Cats thrive on comfort, security and familiarity. When introduced to a new environment, it is important to let your cat explore every nook and cranny gradually. This provides him with valuable information about his surroundings and helps him feel secure. Human caregivers need to make sure areas where the cat may escape to be blocked off (e.g., the underside of beds, under dressers or bookcases, inside closets). Cats are masters at hiding. A particularly shy cat can remain out of sight for days if hiding spots are available. Always approach him at his level. Don’t stare directly into his eyes; rather, talk softly to him and offer a few slow blinks before turning away. Stay with him during feedings, so he associates you with positive things. Try to find toys that engage him. Play regularly and consistently when he is willing. Anytime a positive behavior or interaction occurs, offer treats, soft praise or an appropriate caress (no belly rubs). Most important, let him move at his own pace. If he isn’t ready to be picked up, don’t pick him up (unless absolutely necessary). If he is only comfortable having the sides of his face and chin rubbed, don’t keep trying for a full-body caress. This process may take several weeks to months. But the time will be well spent as your new cat begins to show signs of trust and affection, such as following you around the house, rubbing against your legs or arms, sitting next to you and sleeping near you. There are many advantages of a multiple cat household. Welcoming a new cat into a home that already has a resident cat is exciting but should be handled carefully with consideration for each cat. The key is to introduce your new cat in a systematic and gradual way, utilizing the principles of desensitizing and positive reinforcement. Keep them separated for a few days. Create a separate space for your new cat with a litter box, toys, water, bed and a scratching post. A spare bedroom or bathroom is perfect. Introduce smell first. Get your current cat used to the smell of the new cat by rubbing a towel or washcloth gently over the new cat. Let your current cat smell the towel. Do the same for the new cat. Don’t be alarmed by hissing or growling. These are normal reactions. Encourage interaction through the door. Place your new cat’s food near the door of his room so he stays near it. Your existing cat will smell and hear him through the door. Give your existing cat treats near the door of the new cat’s room so he associates it with good things. Let the new cat roam alone. Put your existing cat in the bedroom. This lets your new cat explore and get exercise. Then, put the new cat back in his room and let the existing cat walk around and smell him without having to see him. This further helps them get used to each other’s scent. After a few days, open the door just a crack so the cats can see each other but cannot stick their heads out. Be prepared for some hissing and growling. If one tries to smack the other, close the door. Continue this fairly often, perhaps once or twice a day. If you observe these behaviors, try to distract and separate the cats. This can be done by clapping your hands, throwing a pillow between the two or by using a wand toy to distract the two. Do not yell, and most important, never put your hands or body between the two cats. Keep the cats separated when you are not home until you are certain they are safe around each other unsupervised. Do not expect true love. We all wish our cats would become best buddies and curl up together. This does not always happen. They may not want to hang out together, but they will eventually respect each other’s space. Cats are intelligent creatures. They learn by observation, imitation, and trial and error. Most behaviorists believe cats lead healthier, happier lives with another cat in the house. Sharing the house with another living creature helps break up monotony and loneliness and creates a more socialized cat. Boredom is the root of many behavior problems. The best way to prevent boredom is to adopt a companion who will act as a playmate, partner and friend. A cat companion also reduces the risk of your cat developing destructive behaviors or becoming depressed or incredibly needy when you are home. 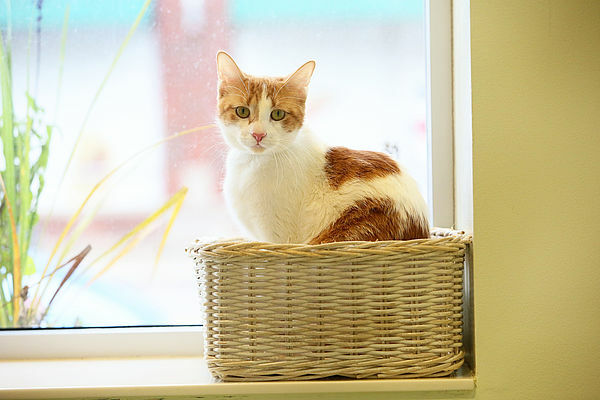 Young male cats (3 to 24 months) have an especially strong desire for a buddy. However, even with a companion cat, human caregivers will most likely still need to provide both cats with structured play experiences. 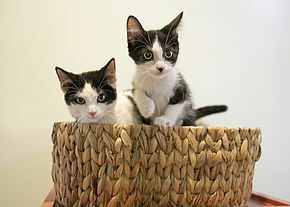 Before moving forward and adopting a solo kitten or young cat, consider welcoming two kittens into your home instead. In many cases, two can be easier and more beneficial for both of your feline friends. Kittens are curious and crave constant stimulation. When bored, a single kitten will find ways to entertain himself, sometimes resulting in chewing on plants, climbing drapes and furniture, unrolling toilet paper or exploring electrical cords and sockets. When a kitten has another kitten to play with, it is less likely he will need to entertain himself with destructive behaviors. Kittens also tend to be very active at night. A single kitten is likely to keep his owner awake with constant jumping, pouncing and other hunting behavior. With a companion to play with after you have gone to bed, this behavior is minimized. The two can occupy each other by finding interesting shadows to chase and games to play until they tire and fall asleep. Kittens want and need interaction with other kittens for healthy social development. A kitten learns a lot in the first several months of life from his mother and littermates. Kittens who are able to remain with one of their littermates or a similarly-aged companion tend to be healthier and happier, and in the long run, better-socialized than those who are isolated from others of their kind. Part of kitten behavior is biting and wrestling with one another. It is not acceptable for a kitten to bite and wrestle with his human companions. But in the absence of having a littermate or companion to play with, this is precisely what he will do. Proper dog training is the key to a successful introduction. Once your cat is confident the dog does not pose a threat, the opportunity for a wonderful friendship can begin. Keep them separated for a week or so. Have a separate space set up for the cat with a litter box, toys, water, bed and a scratching post. Before letting the pets see each other, let them smell each other’s bedding. Scent is the most important factor in cat-to-dog introductions. Encourage interaction through the door. Place your cat’s food near the door of his room so he stays close to it. Your dog will smell and hear him. Give your dog treats near the door of the cat’s room so he associates it with good things. Put your dog in the bedroom and let the cat roam. This lets him explore and get exercise. Then put your cat back in his room and let the dog walk around and smell the new cat without having to see him. This is a great way to get them used to each other’s scent. Reward obedience on the dog’s part with a treat. If possible, allow the animals to observe each other while separated with a baby gate or screened door. Keeping the dog in a crate while the cat is allowed to safely observe the dog is one way to help the cat acclimate to the dog’s presence. Now it is time for the introduction. Make sure your dog is wearing a properly fitted collar and leash. Have another family member bring in the cat and sit down with the cat next to them at the opposite end of the room. (Please be cautious and pay attention to your cat’s body language.) Repeat this step several times until both the cat and the dog tolerate each other without signs of fear or aggression. Move the animals closer with the dog still on the leash and the cat gently held next to you. If the cat does not like to be held, use a crate or carrier. If the cat becomes frightened, increase the distance between the animals and progress more slowly. Initially, the dog should be wearing a collar and a leash when the cat is present so any attempt to bark at or chase can be stopped instantly. Praise and treats should be lavished on the dog when he is calm and obedient in the cat’s presence. Keep the dog and cat separated when you are not home until you are certain that the animals are safe around each other unsupervised. Be sure the cat does not have to pass through or by the dog’s area to get to his food, water or litter box. If your dog enjoys raiding the litter box, place a gate across the entrance of the room where the litter box is to allow the cat to pass through but not the dog. When introducing a cat to a home with children, it’s best to start by teaching your children how to properly hold and pet a cat. Understanding basic body language is important, too. This way, they will know to leave your new cat alone when his ears are back, his tail is twitching or he is growling or hissing. A kitten (4 months and older) or young cat is usually better with children under 7. They can better withstand a young child’s quick movements and noise. Always supervise the interactions between your cat and child. Children can share in the responsibility of caring for your cat as long as an adult is ultimately in charge of making sure that the cat is properly cared for. Cats make great companions for seniors. To avoid accidental scratching or nipping, it’s important they learn how to properly hold and pet a cat. They should also learn basic cat body language so they will know to leave the cat alone when his ears are back, his tail is twitching or he is growling or hissing.